(PhysOrg.com) -- A breakthrough in components for next-generation batteries could come from special materials that transform their structure to perform better over time. A team of researchers at the U.S. Department of Energy's Argonne National Laboratory, led by Argonne nanoscientist Tijana Rajh and battery expert Christopher Johnson, discovered that nanotubes composed of titanium dioxide can switch their phase as a battery is cycled, gradually boosting their operational capacity. Laboratory tests showed that new batteries produced with this material could be recharged up to half of their original capacity in less than 30 seconds. By switching out conventional graphite anodes for ones composed of the titanium nanotubes, Rajh and her colleagues witnessed a surprising phenomenon. As the battery cycled through several charges and discharges, its internal structure began to orient itself in a way that dramatically improved the battery's performance. "We did not expect this to happen when we first started working with the material, but the anode spontaneously adopted the best structure," Rajh said. "There's an internal kind of plasticity to the system that allows it to change as the battery gets cycled." According to Argonne nanoscientist Hui Xiong, who worked with Rajh to develop the new anode material, titanium dioxide seemed like it would be unlikely to adequately substitute for graphite. "We started with a material that we never thought would have provided a functional use, and it turned into something that gave us the best result possible," she said. 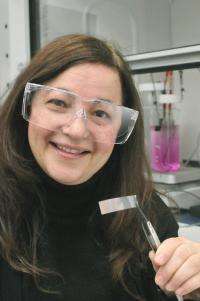 One of the other researchers in Rajh's group, Sanja Tepavcevic, has adopted a similar approach to make a self-improving structure for a sodium-ion nanobattery. "This is highly unusual material behavior," added Jeff Chamberlain, an Argonne chemist who leads the laboratory's energy storage major initiative. "We're seeing some nanoscale phase transitions that are very interesting from a scientific standpoint, and it is the deeper understanding of these materials' behaviors that will unlock mysteries of materials that are used in electrical energy storage systems." The reason that titanium dioxide seemed like an implausible solution for battery development lies in the amorphous nature of the material. Because amorphous materials have no internal order, they lack the special electronic properties of highly ordered crystalline materials. However, amorphous materials have not been known to undergo such profound structural transformations during cycling, according to Rajh. Most of the known battery materials undergo the opposite transition: they start out as highly crystalline and pulverize to an amorphous state upon cycling. Having anodes composed of titanium dioxide instead of graphite also improves the reliability and safety of lithium-ion batteries. In certain cases, lithium can work its way out of solution and deposit on the graphite anodes, causing a dangerous chain reaction known as thermal runaway. "Every type of test we've conducted on titanium anodes has shown them to be exceptionally safe," Chamberlain said. The Argonne discovery came from collaboration between two of the laboratory's flagship user facilities: the Center for Nanoscale Materials and the Advanced Photon Source. By combining state-of-the-art nanofabrication techniques with high-intensity X-rays to characterize the nanotubes, the Argonne researchers were able to quickly observe this unusual behavior. Redefine the capacity as Charged at the 30 second mark and call the remaining 50% supercharged. This will let you market the batteries as super fast charging with the ability to pack the same amount again of charge in the battery if you have extra time to sit and wait for it to fully charge. If this can be used for Electric Vehicles at the same 30 second period for 50% of the total capacity, you have solved the charging station/time issue. I think that 30 second charge time is usable with small appliances, like cell phones, media players etc, but it will probably never work so fast with EVs. And the reason is that one would need to transfer electricity with such a huge power that it would be impractical. Here is some calculation: Nissan Leaf with 24 kWh of storage would mean 12 kWh transferred in 30 seconds. 12 kWh equals 43200 kWs or 43.2 MWs. That divided by 30 seconds gives us 1.4 MW of transfer power. If this transfer is done at lets say 360V (Leaf battery voltage), then needed current would be 4000 Amperes or 4 kA. Charge electronics, if even possible to do, would be incredibly expensive at those currents. Also the needed rails (conductors instead of wires) would be railroad track thick or more. So fast charge for EV batteries is not very practical. If we designed the cars to us the entire underside as one big docking station then the surface area might be enough to bring current densities down into workable ranges. If we charge cell blocks individually then not all 4kA need to go through one 'wire' but only 4kA divided by the number of cells. Switching from serial 'drive mode' to parallel 'charge mode' isn't much of a technical problem. Transferring such a jolt from the power station is probably the bigger problem (i.e. having a storage medium there that can deliver such energies intermittently). Maybe have banks of supercapacitors charged up at the power station in between cars using it? But 30 seconds recharge time would surely be THE breakthrough for electric vehicles - even if their ranges on a charge stay in the 150km region. The Nissan Leaf gets the equivalent of 100 miles with 34KWH. To charge it in 30 seconds would require 4.08MW's from the charger. That is 4,080,000 / 240 VAC = 17,000 amps. If you wanted an electric car that had a 300 mile range, to charge it in 30 seconds would require 51,000 amps at 240 volts. Even if the charger was 95% efficient, at 4.08MW's the charger would have to dissipate 204KW's of heat in that 30 seconds. This seems to be almost impossible. Even if a 5 minute charge time was acceptable, it would require 5,100 amps, and that doesn't include the charger losses. Now you can see why liquid fuels and hybrids are so attractive compared to pure electrics. All this sounds fine if we had the generating capacity. Electric vehicles are impractical for the masses until we have the generating and distribution capacity to support them. but as power companies need to handle load balancing to reduce required generating capacity already the last thing they want is to build more power stations to handle the load when everybody arrives home from work and plugs in their car to charge. Electric Vehicles are only practical if they are charged overnight unless you have another local battery which you charge slowly and then use to fast charge the car, but this would not be economically viable or practial for most people. probably never work so fast with EVs. And the reason is that one would need to transfer electricity with such a huge power that it would be impractical. Here is some calculation: Nissan Leaf with 24 kWh of storage would mean 12 kWh transferred in 30 seconds. 12 kWh equals 43200 kWs or 43.2 MWs.... That divided by 30 seconds gives us 1.4 MW of transfer power. ...) would be railroad track thick or more. So fast charge for EV batteries is not very practical. We could easily design the car to accept the charge into different charging zones, so the car plugs into several outlets at once (Divide and conquer). While a home electric system would be inadequate to provide this kind of power, the idea of a 30 second charge would be to charge it at the gas station (SIC) where they would spend the extra money to have the proper charging infrastructure that is able to handle this amount of power. Since when did we use heating elements as power lines? I'm fairly certain that HVT Lines don't heat up to thousands of degrees and melt. 1) Heat is caused by resistance - if you have a thicker (Or lower resistance materials) cable, you have less resistance. 2) If you have to dissappate 204KW worth of heat, then you have not stored any of it have you? I'm not even saying that this is even a simple task to charge that much or that heat management might not be part of it - But I am saying that you are really far off the mark with your comment. The heating is mostly caused by the switching losses in the converter, and you aren't going to get 25 kV delivered to your house, much less semiconductors designed to work at that level. The charging station is going to look like one of those HVDC rectifier stacks that run two stories high with great big IGBT pucks and ceramic isolators in between to prevent it from arcing, just to get you a couple megawatts for 30 seconds at a time. A single transistor that can handle anywhere near the power levels we're talking about here is the size of your two fists, and costs as much as a second hand car, and you'd probably need ten. Switching from serial 'drive mode' to parallel 'charge mode' isn't much of a technical problem. Would that be possible? If you can connect let's say 48 connectors each delivering 1/48 of that 1.4 MW (= 30kW). That would then be 30 kW / 7.4 V = 4 kA per each. I still think that having all cells in series as 360 V would be easier, since you would need only one 4 kA connector instead of 48. I just wonder what size cell-to-cell interconnect bars would need to be to be able to handle 4 kA? Unfortunately, i do not have enough knowledge to truly get into all the details of designing a practical system that can handle this amount of charge, and obviously, it would not necessarily be a simple system. However, my main point was to drive the conversation into a realm more in line with reality, rather than one that includes ridiculous statements about dissappating 204KW worth of heat, and the ignorant idea that it has to be charge by a single cable. While I think both of your latest comments were fairly reasonable, I'd still like to point out that it would likely resemble a computer power supply - Converted to DC at the facility, rather than in your car - and probably using bundles of multiple wires, likely far more than 48 in aggregate. Your home pc has more than 48 power connection points from the dedicated power supply cables, down to the pci ports. Lastly, from a practical standpoint - They probably won't have 30 second charging stations because, why would they? From a business standpoint, if it can be charged in thirty seconds, but I can save 75% of my capital expenses by building a charging station that will do it in ten minutes...Then it will take ten minutes to charge your car. So divide by 20 and redo the math. Also, how about we use the standard 100 amps, and base the voltage requirements on that. Mind you, I have not checked the original math. If charging voltage was 4000 volts and people were willing to wait 2 minutes instead of 30 seconds the amperage becomes 255. No exotic conductor required. Or you could go with lower voltages and separate conductors if that were more cost effective. Charging arrays of batteries in series reduces the need for expensive high voltage gear. I'm really excited about all the R&D going into batteries. It is just not electric cars but also critical to enabling significant mixes of wind/solar in future. If charging voltage was 4000 volts, it would be incredibly dangerous. Fusing is nearly impossible and expensive at these voltages because you end up with a plasma arc that is almost impossible to quench. This is especially worse at DC because the voltage doesn't periodically go to zero. For "that guy" you can't just hook up a voltage supply to a battery, you must control the current, which means a switching regulator. The heat losses I'm talking about are nor copper wire resistive losses. To get efficiencies in the semiconductors and magnetics to be greater than 95% is difficult and expensive, to get above 98% is nearly impossible. This means the switching power supply is dissipating 100's of KW's of heat. Also it doesn't matter whether you have 100 switching regulators at 95% efficiency or one big one at 95% efficiency, the total losses are the same. For tbp...Please read the comment that applies to what you're talking about before spouting off. First off, I'll pick on your math. If you are 95% efficient, and you are charging a 204 KW car, then you need to dissapate 10-11 KW hours. Second, those efficiencies get higher as you upsize, do to lower resistance - See third point. Third, you certainly can put the voltage conversion equipment and regulators to control the current, amperage, voltage, etc at the 'gas station', rather than in the car. What does this mean TBP? This means that you could have a little substation out back that does all the heavy lifting (and yes, maybe 100s of KW of aggregate heat dissapation, because it does many cars simultaneously), and up front, you simply have a special plug all ready with pre-conditioned DC power. Just like a pc mother board and it's power supply. Except in this case, the gas station has the power supply. Look, no one's saying that it's necessarily practical to charge a whole car in 30 seconds (Why we're throwing around the ten minutes number) - but there are many ways to slice a cat on this electrical problem, and some of you are being narrow minded to the different ways to solve it. We are operating on the assumption that you will not use home power or a single point connection to do this. We are operating on the assumption that you wouldn't put all the power regulating equipment for a quick charge in the car because it would be ridiculously stupid. Please don't accuse me of "spouting off". A electric car that can go 300 miles will require about 100KWH of energy storage. If you charge it in 10 minutes, it will require 600KW of charging power. If the charging circuitry is 95% efficient it will be dissipating 30KW of heat during the entire 10 minutes of charging. If the battery charging efficiency is 95% at this power level the battery in car will also be dissipating 30KW of heat during the entire 10 minutes. If this is done at a 'gas station' with six cars charging at the same time, the station will be dissipating 180KW of heat continuously. The power needed by this 'gas station' will be 6 * 600KW or 3.6MW's. This is the equivalent of a power station for 4500 homes at every 'gas station'. You obviously have no concept of how difficult and expensive it will be to balance the charge on the cells in the batteries at these power levels and the amount of circuitry that will needed, either in the car or in the 'gas station'. And no one has yet mentioned the overvoltage in the batteries. (Well tpb mentioned it in passing.) To charge a battery you have to use a voltage higher than the (theoretical) battery output voltage. Could you manage a 30 second charge with a 5% overvoltage? Probably not, but let's say we could. How many gallons of water are you going to flash into steam to keep the battery from exploding? I used to work with high-power (and high-voltage) lighting equipment. One nice engineering rule of thumb was that for system stability, every component that stored power needed to store the same amount of power. Obviously when designing an electric vehicle charging system, you would much rather have an electronic current limiting system. Reason we didn't was the cost. Transistors that can switch several kilowatts of power are very expensive--and for an AC to DC charging system you will need several. At the kind of charging levels we are talking about here, it would be a LOT easier to have a small liquid nitrogen generating plant on site and use HT superconductors. This would reduce losses to near zero with of course the added cost and inefficiency of generating and using the coolant. Since the 4KA bars between the cells need only be in place for the charging cycle, the charger would probably require a snap in mechanical component connecting the cells only when they are charged, also cooled with liquid N2. If this isn't reason enough to Abolish the Department of Energy, then I don't know what is. Well, you said it yourself. You don't know what you're talking about. Ron Paul supporters are well known for proposing the elimination of vital sections of our government for no coherent reason. Most of us reject Ron Paul because we don't want to live like monkeys in trees. Most of the above comments are off topic. The scientists involved have made a very fine battery breakthrough. Good work. Ron Paul supporters are well known for proposing the elimination of vital sections of our government for no coherent reason. That was VD's point. He doesn't actually like Ron Paul. I am not sure if VD likes anyone. Lot of noise hear about 30 second this and 10 minute that. There's a better solution under development in Europe (though I think the entrepreneur is American). Battery packs are standard shape and size, snapped into the undercarriage of the vehicle. You drive into the "charging" station and stop over a mechanism that removes your depleted battery pack and replaces it with a fully charged one. You drive away in two minutes. They can take all night to charge the packs to capacity, if they store enough of them. ya swappable batteries seems more intelligent. That allows new tech to be implemented into the battery with just a "core charge". This study could help move towards a better charging system for those battery stations.